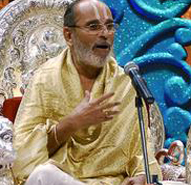 Following the foot steps of his father, Sri Srinidhi Swami, a celebrated descendant of this renowned lineage, Sri Karunakarachariar Swami has continued the tradition of Acharyapurusha Sampradayam as established by Bhagawat Ramanuja and has been performing Samashrayanam and Bharanyasam for the disciples of Nadadoor Ammal Tirumaligai for the past four decades. He is an erudite Scholar in Sri Bhashyam and has been actively participating in Sri Bhashya Vidwat Sadas held by various institutions like Sri Malola Vidwat Sadas organized by Sri Abhoila Mutt, Sri Paduka Vihara Vidwat Sadas conducted by Srimad Andavan Ashramam, Sadas held by Poundareekapuram Andavan Ashramam, Sri Parakala Mutt etc. For the past seven years, he along with his brother has been carrying forward the tradition of conducting Sri Nadadoor Ammal Vidwat Sadas which was initiated by his father 55 years ago. He also been conducting Vidwat Sadas at Thiruvananthapuram on the ocassion of the Thirunakshratram of Sri Gopala Samudram Nadadoor Srinivasa Seshaswami for the last decade. He is a mutilingual prolific writer who has been contributing articles in English, Sanskrit, Tamil for magazines like Vak, Sriranganathapaduka, Hayagreevapriya, Sri Nrisimhapriya Sudharma etc. His immense contributions to the cause of Sri Vaishnava Sampradayam has been recognized by various institutions. Srimushnam Srimad Andavan conferred upon him the title of “Shastra Sahiti Vallabha”, in the inaugral ceremony of felicitation of Vedic Scholars, along with leading scholars of our Sampradaya like Sri U. Ve. Navlpakkam N. S .Ramanuja Tatacharya Swami. He was also awarded the title of “Pravachana Bhooshanam” by the Vendata Desika 700th Thirunakshtram Committee. Srimad Paravakottai Andavan Swami conferred upon him the title of “Sorkondal” and “Desika Darshana Choodamani”. “Varavakchaturah”, Pravachana Tilakam”, “Vidwanmani”, are some of the other titles awarded to him by various institutions and eminent personalities. Sri. Karunakarachariar Swami, who was born in the Tamil year ”Sarvajit” (1947).